If you’re new to affiliate marketing and you’re not sure what it’s all about, then this post is for you. Affiliate marketing is basically all about promoting other people’s products online and getting paid a commission whenever your recommendation of a product leads to a sale. The process of becoming an affiliate marketer involves building a website, creating content and placing affiliate links to the specific products you want to promote within that content. When someone clicks on any link on your website and buys that product (within a certain timeframe), you get paid a commission. It’s a lot simpler than it sounds, particularly when you have a clear plan to follow. There is a wide variety of affiliate networks that you can join online to find the right products for you to promote. If you pick a niche or topic that you find interesting, building your affiliate website can actually prove to be a lot of fun. Of course, you first need to do a little market research to make sure that the topic you pick is also profitable. There’s no use picking the most interesting topic in the world if no one is going to pay for any products in that niche. 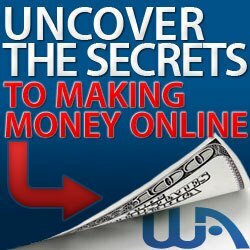 The goal of becoming an affiliate marketer is to make money using just your computer and your time. In this post, we’re going to take a look at some essential affiliate marketing concepts as well as a quick and simple way of setting yourself up to make real income online using the affiliate marketing business model. One of the best things about affiliate marketing is that you don’t have to own any products to start making money. All you need to do is connect a seller with a potential buyer – and that’s it! You don’t even need to do any of the work to convince people to make a purchase. The merchant will do all that work. And if the sale is made, they take care of everything from the delivery of the product to any customer complaints, returns, etc. You don’t have to do a thing after sending them the customer. Simply sit back and wait for the commission you’ve earned. 1. Very Low Startup Costs: If you were starting a regular business, you’d need to rent space, get stock inventory, and hire staff, and so on. It could easily cost you tens of thousands of dollars to get started. With affiliate marketing, you can get started for the price of a coffee at Starbucks. 2. No Staff Needed: You can do this all on your own. Office politics and messy payroll handling will be a thing of the past. When you eventually need to grow your business, it’s very easy to outsource. 3. No Product Necessary: Instead of waiting weeks while developing your own product, with affiliate marketing you can get started immediately. The products are already available and ready for you to sell. No matter what niche you’re in, there are products that you can sell as an affiliate. 4. No Expertise Required: You do not need to be an expert on any subject to sell affiliate products. All you need is to ensure that your mindset is one of learning. Once you have a plan to create your affiliate website, find and market the right products (at the right time, to the right people), your success is assured. 5. Passive Income Potential: Earning passive income is the ultimate dream for most people who start businesses online. Passive income is simply money that keeps coming in even without any additional effort from you. So, instead of getting paid once for the work you’ve done, such as in a normal job, with passive income you continue to make money from the same work, day in and day out. 6. Choose Your Own Hours: Forget about all those people that try to make you believe that owning an online business means you’ll get to sit on a beach all day drinking Pina Coladas… The reality is very different from that – at least at the beginning. But, being your own boss does mean that there is a lot of flexibility when it comes to the hours you work, and that’s something a lot of people appreciate. How Much Can You Actually Earn as an Affiliate? As with any other type of business, the money you can make as an affiliate depends on the effort you put in as well as how serious you are. It also depends on the roadmap you’re following on your journey to becoming an affiliate marketer. Without the right plan, you might spend your time going around in circles and doing things that don’t work. So, for instance, if you only work on your affiliate business for an hour each day, or if you spend most of your time tweaking your website’s theme, checking your email, social media, etc. instead of actually doing the work to build and grow your business, then chances are you won’t be able to make much money as an affiliate. But, with dedication and consistency, you’ll be able to make a full-time income from your business in a relatively short amount of time (compared to the majority of people who spend an average of 18 months before they start to see any sort of income from their online business). Do You Really Need a Website to make it Work? Actually, you don’t need a website to make money as an affiliate marketer. There are many different ways to go about it, and some don’t involve creating a website. There are some who are doing it through other channels such as social media, but having a website makes things a lot easier, particularly if you’re going to be creating a lot of content to promote your products. When you own your own piece of digital real estate, you have full control over it, unlike social media or other platforms that can be taken from you for whatever reason. Also, having a website gives you the opportunity to build your brand – something that will significantly benefit your affiliate business in the long run. There are many different ways that you can place commission-earning links on your site. Some can be banners sourced from the merchant, or you can add simple text or image links within your articles. Just make sure that the product you’re recommending is relevant to the content. The way that most affiliate marketers do it is to write content on a particular topic and then they link to a related product that could be useful for their readers. This means they are lined up to earn commission each time someone clicks on that link and purchases that product. On your own site, you can talk about various affiliate products and recommend them to your readers. You can also give detailed reviews and make comparisons. Whatever you can do to give your audience the information they need to make their buying decision will work. You get your affiliate link from the product seller, and it includes a tracking code in it to ensure that you’ll be credited for each sale made through your recommendation. This means that whenever a customer clicks on the affiliate link, the merchant knows that the customer was sent by you. It’s important to note that the customer isn’t affected by the affiliate links at all. They don’t pay extra and they won’t be missing out on anything. In fact, they usually aren’t even aware they purchased the product through an affiliate link. You’re getting your commission directly from the merchant – but only if the customer buys the product within a certain period of time after clicking on the link. So, the main goal with this type of business is getting as many people as you can to click on your links and visit the merchant’s page. Although the number of sales you make will depend a lot on how well the merchant’s page converts visitors, it stands to reason that the more people you can get to click on your links, the higher the chances of making sales and earning commission. That’s why getting web traffic is such an important aspect of affiliate marketing: More traffic equals more clicks, which translates to more money. There is a massive range of methods that you can use to get visitors to your affiliate websites. You can signal to Google and other search engines that your site is relevant to your topics (Search Engine Optimization – SEO), or you can spread the word on your social media networks (Social Media Marketing – SMM). These are just two of the many, many means of driving traffic to your website that are available to you. The good news is that you don’t have to do them all. The trick is to find something that works for you and suits your strengths, then go with that. It doesn’t take much to get the ball rolling on your affiliate website. The more you can automate this part of your business, the closer you’ll be to true passive income. Although some of these methods cost money, you can see the traffic results immediately. Others like SEO are free, but they do take a lot of effort or time before they start to yield results. 1. Pick a Topic: This has to be something that you’re not only interested in, but that has loads of market potential. There should already be products associated with the topic that you can sell as an affiliate. 2. Look for Products to Promote: After picking out your niche, it’s time to find products you can promote. Simply look for ‘affiliate network’ websites and browse through them. Find the best products and get affiliate links. 3. Build Your Website: This is probably going to be the simplest part. These days building a website can be done with a few clicks of your mouse thanks to WordPress and other similar sites. 4. Develop Relevant Content: Now it’s time to fill your website with relevant content that is valuable to your target audience. Don’t forget to include your affiliate links within your posts. 5. Promote your website: This is the fun part. Choose which of the traffic methods you want to use – free, paid, or a combination of both. Get started sending visitors to your site, and watch the money start to flow in. It may be a trickle at first, but with consistency and determination, you’ll soon see a flood of commissions coming your way! If you’re starting to feel overwhelmed, don’t panic. As I said before, this is a lot harder to explain than it is to execute. Getting started won’t be nearly as hard as you’d imagine. Now that you’ve got the basics down, it’s only a matter of setting up your website and finding products to promote. The most important thing is to take action. Don’t be afraid of ‘doing it wrong’, just DO IT! Most people overthink and overanalyze everything to such an extent that they get paralyzed and are unable to move forward. Just pick one thing to do and do it. If you don’t get it right first time around, that’s OK. It’s the experience that really counts when you’re learning a new business. Over time, you’ll be able to hone your abilities and skills. Just get started right now! Feel free to post your comment below. An email address is required but it will not be shared with anyone, put on any list, or used for any kind of marketing, just to alert you if there are any replies. Thanks and happy hunting!